I colored the image with Copic markers, die cut it with an oval Nestie and gave the image a good spray of Psst! Shimmer Spritz in Sparkle (my personal favorite and impossible to see in photographs). After dry embossing the background with the Tim Holtz Damask folder, I applied Memento Grape Jelly ink direct to the white card stock with a dewdrop inkpad. 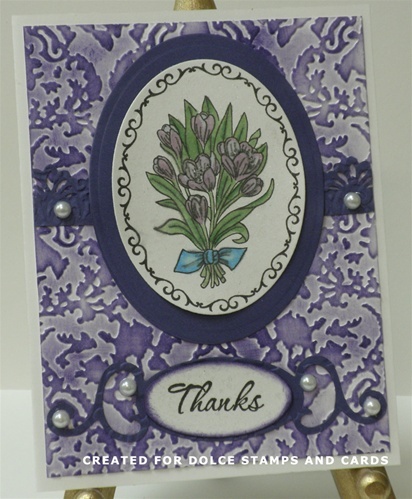 Added a Fancy Tag, border, pearls and am calling it a card. Hope you like it and thanks for looking!